I completed my 200 hours of Yoga Teacher Training in Italy in August 2016. My family and I were living on the small island of Bermuda, at the time. Completing my training made me realize this was just the start of a journey. There was so much more to learn and develop. As a highly knowledgeable and experienced school teacher, I had to leave my ego, my comfort zone, and tune out the doubts and fears I had. Primarily fears about not being good enough to teach yoga. The people who chose to practice with me and attend my class deserved the best, but I didn’t feel quite ready. I was used to being confident, but I now needed to develop a whole new skill set. I started working with the Bermudian charity MAMA, providing free “child-friendly” yoga sessions for mothers within the local community. There was a massive demand for this, and I was able to practice my teaching, win-win! Many of the mommas who attended were pregnant. Some had been through rounds of IVF to become pregnant. I became very anxious about these lovely ladies harming themselves or their babies during (or because of) my sessions. At that time, Ma Yoga was offering their prenatal yoga training at the Lucky Elephant Yoga Studio in Bermuda. I quickly enrolled after researching Ma Yoga. Even though we couldn’t afford it, I knew I just had to do it. Perfect timing — it was meant to be! I signed up for the Ma Yoga Prenatal Teacher Training purely to be more confident in guiding mommas-to-be through my regular yoga class. What I got out of this training experience was a whole world more. It has been a metamorphosis, both personally and professionally. At first, (if I’m honest!) I remember feeling frustrated when I realized it wasn’t going to be a simple two-week training followed by a certificate. Now, I am so very grateful this wasn’t the course structure. Jessica and the team at Ma Yoga have created a certification made up of crucial components. These components allow you to build on your knowledge and training, continually reassessing and reflecting. This deepens your understanding, thus improving and empowering your teaching and your own life. They care. They care about mothers. They care about you as a teacher. They care about the quality provision of yogic practice. Empowerment and care for this whole community are at the core of all Ma Yoga does. Colleen Hieber was beyond amazing. I learned a ridiculous amount from the five days of training. Through the Ma Yoga principles, I was able to develop my personal alignment, understanding of poses, directions and cueing to students. And, I understood the importance of theming and appropriately planning a yoga class. I loved every second! After this course, I would say my teaching became significantly better, for all students, not just the pregnant ones. My understanding had deepened, and my own practice improved. Instead of feeling anxious about teaching pregnant ladies, I felt excited and empowered. 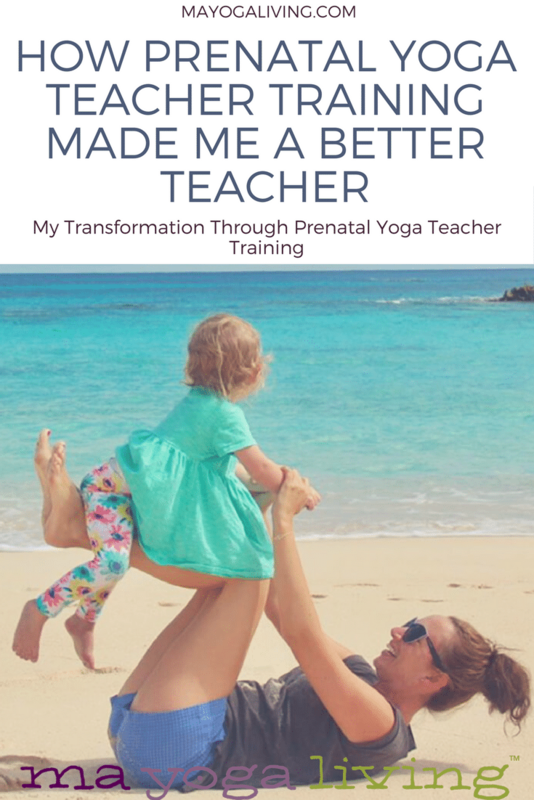 I started teaching prenatal yoga classes, private sessions, and Mom-and-Me classes (which very quickly covered the cost of the course). I left teaching each class feeling ridiculously happy, so proud to be doing my best for these ladies at such a special time and so privileged that I was in a position to be on this journey. How lucky to be doing something so magical, it uplifts your heart and soul every day. Having the mentor relationship and regular video conferences with Colleen was transformative. You don’t always know what you’re doing, no matter how self-reflective you’re trying to be, so having a mentor to celebrate your successes and make proactive suggestions for improvements was fantastic. I am so thankful to Colleen for all the time and care she put into this process. If I had to pick my favorite element of the course, I think this would be it! I knew nothing about Ayurveda before this series of online conference video calls. It just made sense to me. I loved that the structure (weekly video calls) allowed the knowledge to sink in and allowed for more research afterward. I loved the sense of community created. I loved having homework tasks for the week, being given the time to try new things and to develop new routines. This knowledge has improved my health and given me the resources to advise others. And MAyurveda has helped me improve my family life — who knew that would happen? I was very grateful to be able to complete the labor education element to the course online. Again, I enjoyed gaining new knowledge, being part of a community, and improving my overall understanding of a pregnant woman’s body and birthing options. Lauren was also very talented with her guided meditations and inspired me to work on that further. I just wished I had done this course before having my own two children! 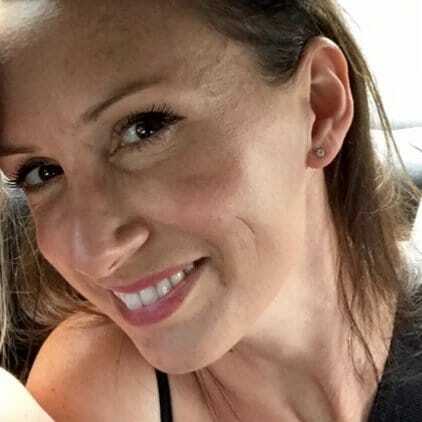 After all of this, the homework yoga class observations, continually teaching and continually revising, and assessing and researching, I am at a different place than I was before I started on my Ma Yoga journey. I still have a long way to go, but I want to do it and keep doing it. I love it! Learning new things and evolving isn’t always easy, but it doesn’t feel so hard when you have a fantastic community behind you who want you to succeed. Thank you, Jessica and all at Ma Yoga. You will never know what an impact you have made on me and how much I have taken from your course. You are truly inspirational. I'm a mum to two beautiful girls, four-year-old Poppy and two-year-old Charlie. I'm also a primary school teacher, a wife, and someone with a passion for lifelong learning.